Who are James & Yvonne Welz? James & Yvonne Welz have owned and trained horses together for 24 years. Initially, they studied all aspects of horse care and management from a traditional perspective, as they competed their personal horses in a variety of disciplines. In 1999, they discovered some better methods of caring for domestic horses, and so began a new journey. 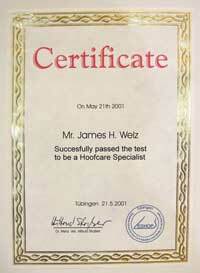 James Welz has been a hoofcare professional (barefoot trimmer) since 2000. He was one of the first in this country to receive a higher education in barefoot trimming, and one of the first to begin a full-time career as a barefoot-only professional. James was, in his "former life," a technical wizard and computer systems administrator until his wife's mare foundered in 1999, and changed the course of their lives forever. In a desperate attempt to save this horse, they immersed themselves in the new barefoot movement, which had only just begun. James immediately began hands-on training with the only educated barefoot hoofcare specialist in North America at that time, Sabine Kells of British Columbia, Canada. In May 2000, he attended the controversial German Veterinarian Dr. Hiltrud Strasser’s first U.S. clinic tour, and promptly enrolled in her one-year course, the first holistic barefoot educational program ever offered in this country. 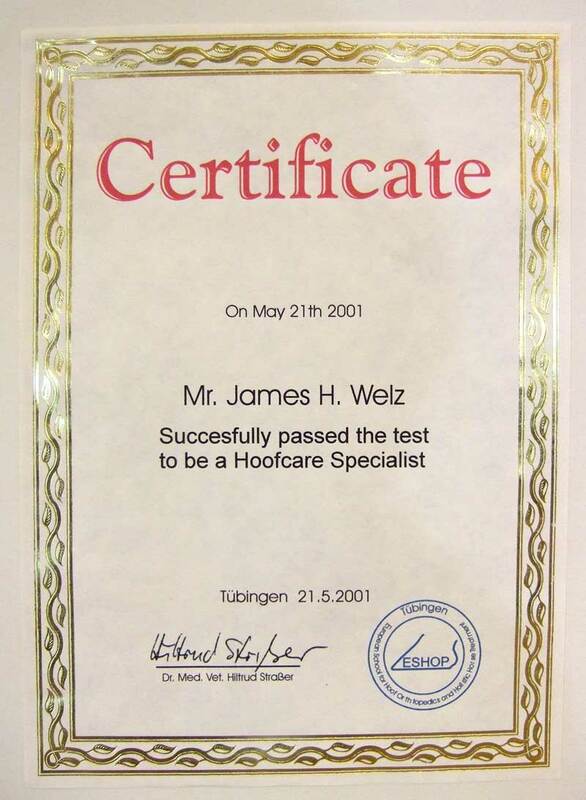 After studies in both Canada and Germany, James graduated in May 2001 in Tuebingen, Germany, with a certificate from the European School of Hoof Orthopedics (ESHOP). James had been trimming about 100 horses professionally while attending school, but upon graduation in 2001, began trimming full time, soon more than doubling the number of horses. He has maintained a consistent client base of about 200 horses per month since then. During this time, he concentrated on learning from the horses, and developing a system that could merge theory with practical reality. His studies included wild horse hooves, Jaime Jackson's research, and Dr. Robert Bowker's research. His most important studies were conducted upon his own horses: seeing the cause and effect of every trim decision, month after month, year after year, upon the same horses. Without that experience, he never could have developed the system as it exists today. Many of his theories about the hoof are unique: building upon information from prior sources, but combined in a way that can only come from a truly mechanical mind. Yvonne Welz is James' wife, business manager, support staff, and publisher/creator of The Horse’s Hoof website and magazine. She was a graphic artist in her "former life," and carried those skills over to create The Horse's Hoof in 2000. She studied along with James throughout the years, and while not a "professional trimmer" herself, has always been an integral part of developing their system. In addition to hoof studies, she has researched horse health, natural care and nutrition, taken courses in homeopathy and bodywork, and studied saddle fit, horse psychology, natural horsemanship, and classical dressage. She has counseled horse owners and answered thousands of trimming and horse care questions throughout the years. She is an experienced and avid equestrian, training dressage and practicing the classical art of high school riding, with an immediate goal of taking the Welz System to the highest levels. James & Yvonne have been happily married, with animal "children," since 1986. Yes, they married very young!